Aims: To evaluate the benefits and harms of treatments for vesicoureteric reflux in children. Methods: Meta-analyses of randomised controlled trials using a random effects model. Main outcome measures were incidence of urinary tract infection (UTI), new or progressive renal damage, renal growth, hypertension, and glomerular filtration rate. Results: Eight trials involving 859 evaluable children comparing long term antibiotics with surgical correction of reflux (VUR) and antibiotics (seven trials) and antibiotics compared with no treatment (one trial) were identified. Risk of UTI by 1–2 and 5 years was not significantly different between surgical and medical groups (relative risk (RR) by 2 years 1.07; 95% confidence interval (CI) 0.55 to 2.09, RR by 5 years 0.99; 95% CI 0.79 to 1.26). Combined treatment resulted in a 60% reduction in febrile UTI by 5 years (RR 0.43; 95% CI 0.27 to 0.70) but no concomitant significant reduction in risk of new or progressive renal damage at 5 years (RR 1.05; 95% CI 0.85 to 1.29). In one small study no significant differences in risk for UTI or renal damage were found between antibiotic prophylaxis and no treatment. Conclusion: It is uncertain whether the identification and treatment of children with VUR confers clinically important benefit. 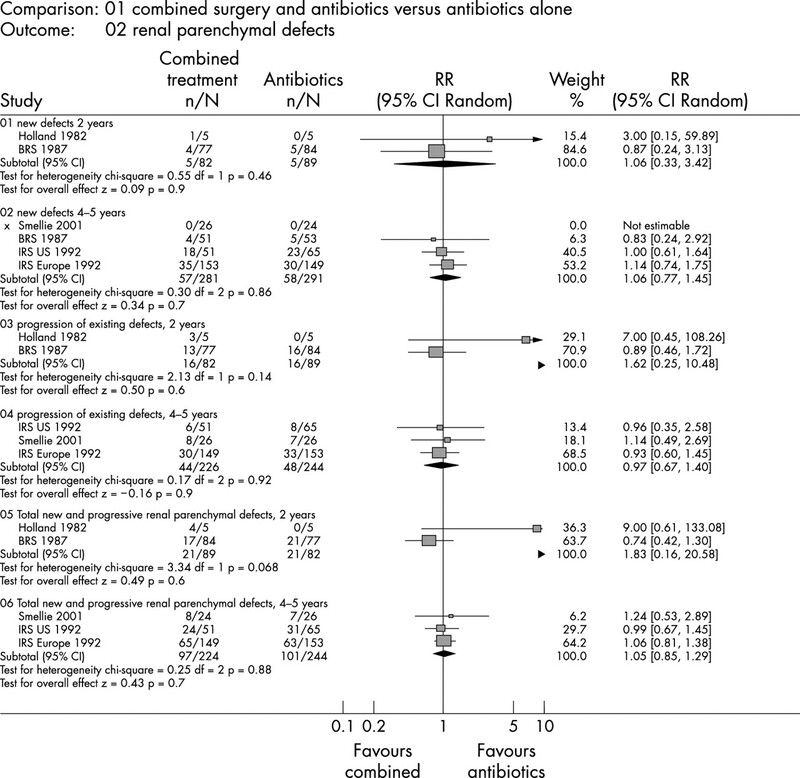 The additional benefit of surgery over antibiotics alone is small at best. Assuming a UTI rate of 20% for children with VUR on antibiotics for five years, nine reimplantations would be required to prevent one febrile UTI, with no reduction in the number of children developing any UTI or renal damage. Little has been published about the harms of diagnosing and treating vesicoureteric reflux in children. The diagnosis of vesicoureteric reflux is usually made by a micturating cystourethrogram, an invasive test that requires urethral catheterisation and is frequently disturbing to children and their parents.7 It also carries the theoretical risks of iatrogenic urinary tract infection and radiation exposure. Surgical reimplantation has general risks of anaesthetic use, postoperative infection, and ureteric obstruction.8 There is increasing concern about the development of antibiotic resistant bacteria following long term antibiotic use.9 Quantifying these potential harms is problematic. Although a common problem in childhood and frequently managed by clinicians, there is considerable disagreement regarding the best form of treatment for children with vesicoureteric reflux.8 We conducted a systematic review of randomised controlled trials (RCT) of the effects of interventions in patients with vesicoureteric reflux (VUR) on urinary tract infection (UTI) and renal parenchymal injury. The aims were to evaluate whether any intervention is better than no treatment and to evaluate the benefits and harms of the different treatment options currently utilised. We included randomised or quasi-randomised controlled trials, which evaluated the management of patients with primary VUR and included outcome data on UTI and/or renal parenchymal injury. The study subjects were patients of any age with VUR diagnosed by micturating cystourethrogram, but without any major urological or structural abnormalities such as obstructive uropathy or spina bifida. Any form of treatment of vesicoureteric reflux was analysed, including surgery (open and closed techniques), antibiotic prophylaxis, non-invasive techniques such as management of voiding dysfunction, and any combination of therapies. Treatment outcomes were collected according to predefined criteria, and included incidence of UTI, renal parenchymal abnormality, end stage renal disease, hypertension, renal functional impairment, and any adverse effects of treatment such as postoperative obstruction. Medline (1966 to February 2003) and Embase (1988 to February 2003) were searched independently by two reviewers (DV, DW) without age or language restriction. The optimally sensitive search strategy for trials developed for the Cochrane Collaboration10,11 was combined with medical subject headings and textwords specific for vesicoureteric reflux. The Cochrane Controlled Trials Register was searched in advanced search mode to identify any additional trials. Reference lists of retrieved articles were searched and those known to have conducted trials of treatment for vesicoureteric reflux were contacted. Relevant abstracts were reviewed independently by two authors (DV, DW) to determine suitability of inclusion. Any disagreements were resolved by discussion with a third author (JC). Where suitability was uncertain or no abstract available, the full article was obtained. Authors were contacted to obtain missing data where necessary. Data extraction was conducted independently by three reviewers (DV, DW, GS) using a standardised checklist for outcomes and quality. The methodological quality of RCTs was evaluated based on randomisation method, allocation concealment, standardisation and blinding of outcome assessment, intention to treat analysis, and losses to follow up.12 Any discrepancies were resolved by discussion with a fourth author (JC). Where the results of a study were published more than once or results were detailed in a number of publications, the most complete data was sought from all sources and included only once for each analysis. Seven RCTs were identified (table 1) which compared the effectiveness of long term antibiotic administration with a combination of antibiotic prophylaxis for 1–24 months and ureteric reimplantation by open surgery (six trials) or Dx/HA copolymer subureteric implantation (one trial). An eighth trial18 compared no treatment with two antibiotic prophylaxis regimens (daily or intermittent antibiotic administration). The eight trials enrolled 947 children under the age of 15 years from the USA, Europe, and New Zealand; data for at least one outcome were available from 859 children. No RCT of any intervention in adults was found. No RCT was identified which compared antibiotics alone with surgery alone or used other interventions including managements for voiding dysfunction. A variety of open surgical techniques were used to correct vesicoureteric reflux, and trimethoprim, trimethoprim/sulphamethoxazole, or nitrofurantoin were used for antibiotic chemoprophylaxis. Generally only children with higher (dilating) grades of vesicoureteric reflux were included in the trials and outcomes were reported at 1–10 years post-randomisation. The method of treatment allocation was satisfactory in five trials (table 2). Only two trials reported that assessment of radiological outcomes was determined without knowledge of treatment groups. Intention to treat analysis was not performed in three trials; in the remaining trials it was not possible to determine whether the analysis had been done on an intention to treat basis. Losses to follow up were generally low: 0–2% at 1–2 years, and 9–42% at 4–10 years of follow up. We combined the results of seven trials comparing antibiotic prophylaxis with combined surgery and antibiotics to obtain summary measures of treatment effects. There was no appreciable difference between the summary estimators using random and fixed effects models (data available on request). Only the results of the random effects models are reported here. The outcomes of urinary tract infection and renal parenchymal abnormality did not appear to be heterogeneous (figs 1 and 2), and formal testing for heterogeneity confirmed this. There were insufficient trials to explore potential effect modification using subgroup analysis or meta-regression. Meta-analyses of relative risk (random effects model) of urinary tract infections. Subtotals pertain to all urinary tract infections at 2 years post-entry (outcome 01), all urinary tract infections at 5 years post-entry (outcome 02), and symptomatic (febrile) urinary tract infections at 5 years post-entry (outcome 03). BRS, Birmingham Reflux Study; IRS Europe, European arm of the International Reflux Study; IRS US, United States arm of the International Reflux Study. Trials are shown ordered by study weights. No heterogeneity was shown using Cochran’s Q statistic (χ2 analysis with degrees of freedom, df). The test statistics Z indicate that there were no significant differences between the combined treatment group and the antibiotic only group of patients with vesicoureteric reflux except for febrile urinary tract infection (outcome 03). Meta-analyses of relative risk (random effects model) for the development of renal parenchymal abnormalities diagnosed by intravenous pyelogram. Subtotals pertain to new defects at 2 and 5 years (outcomes 01 and 03), progression of those previously identified at 2 and 5 years post-entry (outcomes 02 and 04), and all defects, both new and progressive, at both 2 and 5 years (outcomes 05 and 06). BRS, Birmingham Reflux Study; IRS Europe, European arm of the International Reflux Study; IRS US, United States arm of the International Reflux Study. Trials are shown ordered by study weights. No heterogeneity was shown using Cochran’s Q statistic (χ2 analysis with degrees of freedom, df). The test statistics Z indicate that there were no significant differences between the combined treatment group and the antibiotic only group of patients with vesicoureteric reflux. Criteria for UTI, the primary outcome in most trials, were either not given or the microbiological threshold of >105 colony forming units per ml was used. Symptomatic and asymptomatic UTI were not differentiated except in the International Reflux Study (both arms) which distinguished between asymptomatic bacteriuria, cystitis, or acute pyelonephritis. The latter was a clinical diagnosis and was defined as bacteriuria and fever of at least 38.5°C, loin or back pain, or general fatigue which could not otherwise be explained. Results were expressed as cumulative incidence over 1–2 years and/or 4–5 years of follow up. The frequency of all forms of recurrent UTI varied between 0% and 42% in the antibiotic only group, and between 20% and 22% in the combined treatment group by 2 years of follow up (fig 1). By 2 years, there was no significant reduction in the risk of urinary tract infection in the combined treatment group compared with the antibiotic only group (four trials; relative risk (RR) 1.07; 95% confidence interval (CI) 0.55 to 2.09). By 5 years the frequency of all forms of recurrent UTI was 29–42% in the antibiotic only group and 25–40% in the combined treatment group. By five years, there was no significant difference in the risk of UTI between groups (three trials; RR 0.99; 95% CI 0.79 to 1.26). The frequency of febrile UTI was reported only in both arms of the International Reflux Study and was 22% in the antibiotic only groups and 8–10% in the combined therapy groups by 5 years of follow up (fig 1). Children in the combined treatment group had fewer febrile UTI than the antibiotic alone group by 5 years (two trials; RR 0.43; 95% CI 0.27 to 0.70). The overall incidence of symptomatic UTI (febrile and non-febrile) was only reported by the European arm and showed no significant difference in risk between groups (one trial; RR 0.96; 95% CI 0.67 to 1.39). This occurred because the increased risk of febrile infections in the antibiotic only group was matched by a similar reduction in risk of afebrile symptomatic infections in the antibiotic only group compared with the combined treatment group. New and progressive renal parenchymal abnormality on intravenous pyelography were the primary radiological outcomes reported by five trials. No significant differences were found for the risks for new (two trials; RR 1.06; 95% CI 0.33 to 3.42) or progressive renal parenchymal defects (two trials; RR 1.62; 95% CI 0.25 to 10.48) between the treatment groups at 2 years of follow up (fig 2). Similarly the risks for new (four trials; RR 1.06; 95% CI 0.77 to 1.45) or progressive renal parenchymal defects (three trials; RR 0.97; 95% CI 0.67 to 1.40) were not significantly different at 4–5 years of follow up (fig 2). The European arm of the International Reflux Study also ascertained renal parenchymal abnormality at 5 years using 99Tm-dimercaptosuccinic acid scintigraphy.31 Approximately 90% (287/321) of randomised children had scintigraphy performed. Relative to the antibiotic only group, there was a small (5%) but non-significant increased risk of new or progressive scan abnormalities in the combined treatment group (one trial; RR 1.05; 95% CI 0.62 to 1.77, 18% versus 16%). Renal growth was evaluated in four studies21,32,34,36 at 2–10 years by measurements of changes in renal length standard deviation scores (three trials; 510 children) or renal area (one study; 82 children) on intravenous pyelogram (table 1). No significant differences between groups were found at any time point or in any age group. Combining of data in meta-analysis was not possible because of differences in reporting data. Each study reported a number of other outcomes. The two outcomes of greatest clinical importance, end stage renal failure and hypertension, were reported by the two UK studies.21,36 In total six children developed end stage renal failure (three in each arm), and eight children developed hypertension (five in the antibiotic only arm and three in the combined treatment arm). Four studies5,19,21,36 reported data on glomerular filtration rates, but these were unable to be combined because of insufficient reported point estimate and variance data. Individually, no study reported any significant difference between groups. Adverse events for either group were generally not well reported. Postoperative obstruction to the urinary tract occurred in 6.6% of children (10/151) in the European arm of the International Reflux Study. The Birmingham Reflux Study stated that no cases of postoperative obstruction were found after 5 years. No other study referred to obstruction. No other adverse outcomes of surgery, including anaesthesia, were reported. In a single study,18 children were randomised to receive no treatment, daily antibiotic prophylaxis, or prophylaxis given on three days each week. There was no significant difference in risk for UTI (29 children; RR 0.25; 95% CI 0.03 to 1.85) or renal parenychmal injury (29 children; RR 0.40; 95% CI 0.02 to 9.18) between children given no therapy and children given daily antibiotics. No data on adverse events were reported. In children with VUR identified following UTI, no significant differences in the risk for UTI or renal parenchymal injury were found in a meta-analysis of seven trials with 833 evaluable patients comparing antibiotic prophylaxis with combined surgery and antibiotics. A single study involving 29 children found no difference in the risk for UTI or renal parenchymal injury between groups treated with antibiotic prophylaxis or no therapy. However, in the latter study small patient numbers resulted in wide confidence intervals so that differences between groups cannot be excluded. The combined evidence from available randomised controlled trials of interventions in children with vesicoureteric reflux does not provide compelling reasons why the current practice of diagnosing and treating children with vesicoureteric reflux confers important health benefits. The diagnosis of vesicoureteric reflux is most commonly made after urinary tract infection in childhood, when it is widely recommended that children be investigated. With about a 5–10% cumulative incidence of urinary tract infection during childhood, many children have micturating cystourethrography. This test generally requires urethral catheterisation, which is distressing for the children and their families,7 involves exposure to ionising radiation, and may cause urinary tract infection. Medical intervention requires the use of long term antibiotics, which may contribute to the global problem of the development of antibiotic resistant bacteria.9 The diagnosis of vesicoureteric reflux may also cause psychological stress to parents and carers of affected children, who become concerned and anxious when they are told their children have a “kidney problem” and may be at risk of urinary tract infection, renal “scarring”, hypertension, and chronic renal failure. These risks have been regarded as acceptable since the 1960s when the association was made between vesicoureteric reflux and renal parenchymal damage. Although there are associations between vesicoureteric reflux, urinary tract infection, and kidney damage, the assumption that vesicoureteric reflux is a modifiable risk factor is not based on strong empiric evidence from existing randomised controlled trials. In addition recent data from prospective cohort studies suggest that in approximately 50% of children, renal parenchymal abnormalities reflect renal dysplasia associated with dilating VUR rather than damage caused by UTI.37 The belief that children with vesicoureteric reflux should be treated with surgery, antibiotics, or both developed in the 1960s from animal data which showed that infection in the presence of vesicoureteric reflux caused kidney damage. This belief still needs appropriate evaluation with a placebo controlled trial in children with vesicoureteric reflux to determine whether any therapy is effective in preventing significant and progressive renal injury. If vesicoureteric reflux were an important modifiable risk factor for the development of urinary tract infection and renal parenchymal damage, we would anticipate a significant reduction in these outcomes for the combined surgical and antibiotic group relative to the antibiotic only group. Instead, there was no significant difference in the risk of urinary tract infection by 2 or 5 years, and no significant reduction in the risk of new or progressive areas of kidney damage at 5 years using intravenous pyelography or DMSA scintigraphy. Combined surgical and medical treatment only reduced the risk of febrile urinary tract infection at 5 years. Assuming a constant relative risk, the number of children requiring a reimplantation operation at different baseline risk of recurrent infection can be calculated. If the risk were 20%, about nine children would need to be treated with combined reimplantation surgery and antibiotics compared with antibiotics alone to prevent one febrile UTI. If the risk were 10%, 17 children would need to be treated with combined surgical and medical therapy to prevent one febrile UTI. Of all the outcomes assessed, febrile urinary tract infection is the most subjective outcome and is liable to differential misclassification. If this were true of pyelonephritis we would expect to see a reduction in the incidence of new renal parenchymal defects, but this is not the case. A randomised comparison between surgical treatment and antibiotic treatment has not been performed; only trials designed to assess the incremental benefit of surgery over antibiotics alone have been conducted. These show that the incremental benefit of surgery over antibiotics alone is, at best, small and perhaps not worth the potential harms. In summary, our systematic review of randomised controlled trials of interventions for children with vesicoureteric reflux has identified a number of important and unanswered questions. Most importantly, it is not clear whether any intervention for children with primary vesicoureteric reflux does more good than harm. Assuming intervention is beneficial, it is not clear whether antibiotics alone or reimplantation surgery alone are most effective in reducing the risk of urinary tract infection and renal parenchymal abnormality. Furthermore, the trials, which have been undertaken comparing surgery and antibiotics with antibiotics alone, have not shown any additional benefit of surgery except for a reduction in risk of febrile urinary tract infections. Well designed and adequately powered placebo controlled randomised trials of antibiotics alone in children with vesicoureteric reflux are now required. Paediatricians and general practitioners who care for children need to be aware that existing research data do not provide a firm basis for decision making as they consider how best to investigate children following urinary tract infection and treat those with vesicoureteric reflux. The authors would like to thank Professor Les Irwig for his help with methodology and manuscript preparation, and those authors and experts in the field who replied to our requests for study information. This systematic review was performed under the auspices of the Cochrane Renal Group of the Cochrane Collaboration. This study was funded in part by a seeding grant from the Australian Kidney Foundation (Grant no. S2/99). Smellie JM, Poulton A, Prescod NP. Retrospective study of children with renal scarring associated with reflux and urinary infection. BMJ1994;308:1193–6. Hellstrom A, Hanson E, Hansonn S, et al. Association between urinary symptoms at 7 years old and previous urinary tract infection. Arch Dis Child1991;66:232–4. Belman, AB. A perspective on vesicoureteral reflux. Urologic Clinics of North America1995;22:139–50. Frankenschmidt A, Katzenwadel A, Zimmerhackl LB, et al. Endoscopic treatment of reflux by subureteric collagen injection: critical review of five years’ experience. J Endourol1997;11:343–8. Capozza N, Caione P. Dextranomer/hyaluronic acid copolymer implantation for vesico-ureteric reflux: a randomized comparison with antibiotic prophylaxis. J Pediatr2002;140:230–4. Oswald J, Riccabona M, Lusuardi L, et al. Prospective comparison and 1-year follow-up of a single endoscopic subureteral polydimethylsiloxane versus dextranomer/hyaluronic acid copolymer injection for treatment of vesicoureteral reflux in children. Urology2002;60:894–7. Phillips D, Watson AR, McKinley D. Distress and micturating cystourethrography: does preparation help? Acta Paediatr1998;87:175–9. Elder JS, Peters CA, Arant BS Jr, et al. Pediatric vesicoureteral reflux guidelines panel summary report on the management of primary vesicoureteral reflux in children. J Urol1997;157:1846–51. Gossens H, Sprenger MJW. Community acquired infections and bacterial resistance. BMJ1998;317:654–7. Dickerson K, Scherer R, Lefebvre C. Identifying relevant studies for systematic reviews. In: Chalmers I, Altman DG, eds. Systematic reviews. London: BMJ Publishing Group, 1995:17–36. Lefebvre C, McDonald S. Development of a sensitive search strategy for reports of randomised controlled trials in Embase. Proceedings of the Fourth International Cochrane Colloquium, Oct 20–24 1996, Adelaide, Australia. Schulz KF, Chalmers I, Hayes RJ, et al. Empirical evidence of bias. Dimensions of methodological quality associated with estimates of treatment effects in controlled trials. JAMA1995;273:408–12. Review Manager (RevMan). 4.1 for Windows. Computer program. Oxford, UK: The Cochrane Collaboration, 2000. Lau J, Ioannidis JPA, Schmid CH. Quantitative synthesis in systematic reviews. Ann Intern Med1997;127:820–6. International Reflux Study. Vergleich von medikamentoser und chirurgischer Behandlung beim primaren vesiko-uretero-renalen reflux. Urologe1981;20:107–15. Frey P, Gudinchet F, Jenny P. GAX 65: new injectable cross-linked collagen for the endoscopic treatment of vesicoureteral reflux—a double-blind study evaluating its efficiency in children. J Urol1997;158:1210–12. Scholtmeijer RJ. Treatment of vesicoureteric reflux. Results of a prospective study. Br J Urol1993;71:346–9. Reddy PP, Evans MT, Hughes PA, et al. Antimicrobial prophylaxis in children with vesico-ureteral reflux: a randomised prospective study of continuous therapy vs intermittent therapy vs surveillance. Proceedings of AAP. Pediatrics Supplement, 1997. Morris MC, Rothwell DL, Paykel AD. A prospective study of vesico-ureteric reflux and renal function in children. Second CJ Hodson Symposium on Reflux Nephropathy, Christchurch, New Zealand, 1991. Holland NH, Kazee M, Duff D, et al. 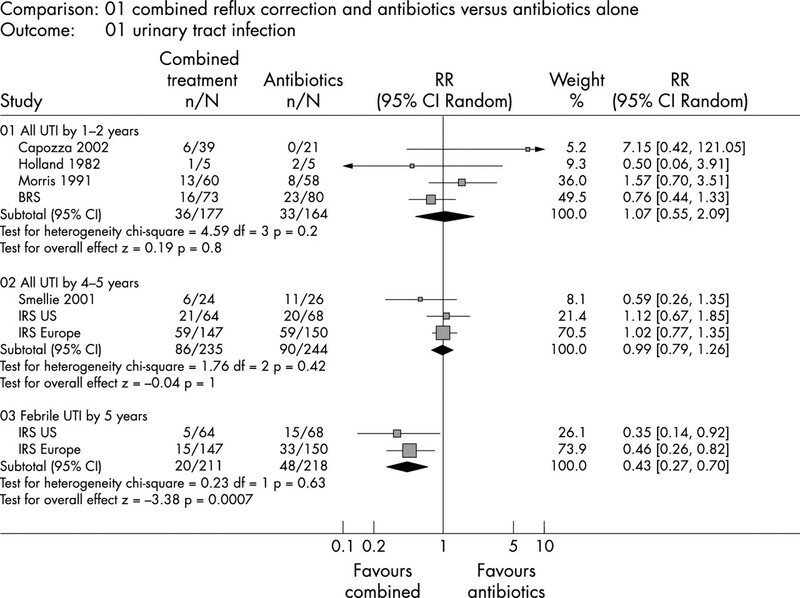 Antimicrobial prophylaxis in children with urinary tract infection and vesicoureteric reflux. Rev Infect Dis1982;4:467–74. The Birmingham Reflux Study. Prospective trial of operative versus non-operative treatment of severe vesicoureteric reflux in children: five years’ observation. BMJ1987;295:237–41. The Birmingham Reflux Study Group. Prospective trial of operative versus non-operative treatment of severe vesicoureteric reflux: two years observation in 96 children. BMJ1983;287:171–4. The Birmingham Reflux Study Group. A prospective trial of operative versus non-operative treatment of severe vesico-ureteric reflux: 2 years observation in 96 children. Contr Nephrol1984;39:169–85. Jodal U, Koskimies O, Hanson E, et al. Infection pattern in children with vesicoureteral reflux randomly allocated to operation or long-term antibacterial prophylaxis. J Urol1992;148:1650–2. Hjälmås K, Löhr T, Tamminen-Möbius J, et al. Surgical results of the International Reflux Study in children (Europe). J Urol1992;148:1657–61. Tamminen-Möbius J, Brunier E, Ebel KD, et al. Cessation of vesicoureteral reflux at 5 years in infants and children allocated to medical treatment. J Urol1992;148:1662–6. Olbing H. Vergleich von chirurgischer und nicht-chirurgischer Behandlung beim primaren vesiko-ueretero-renalen Reflux - Internationale Refluxstudie. Kinderarztle Praxis1986;54:493–9. Smellie JM, Tamminen-Möbius T, Olbing H, et al. Radiologische Nierenbefunde bei Kindern mit schwerem reflux. Urologe1993;32:22–9. Smellie JM, Tamminen-Möbius T, Olbing H, et al. Five-year study of medical or surgical treatment in children with severe reflux: radiological renal findings. Pediatr Nephrol1992;6:223–30. Obling H, Claësson I, Ebel KD, et al. Renal scars and renal parenchymal thinning in children with vesicoureteral reflux: 5-year report of the International Reflux Study in Children (Europe). J Urol1992;148: 1653–6. Piepsz A, Tamminen-Möbius T, Reiners C, et al. Five-year study of medical or surgical treatment in children with severe vesico-ureteral reflux dimercaptosuccinic acid findings. Eur J Pediatr1998;157:753–8. Obling H, Hirche H, Koskimies O, et al. Radiology2000;216:731–7. Duckett JW, Dixon Walker R, Weiss R. Surgical results: International Reflux Study in children—United States Branch. J Urol1992;148: 1674–5. Weiss R, Duckett J, Spitzer A. Results of a randomized clinical trial of medical versus surgical management of infants and children with grades III and IV primary vesicoureteric reflux (United States). J Urol1992;148:1667–73. Weiss R, Tamminen-Mobius T, Koskimies O, et al. Characteristics at entry of children with severe primary vesicoureteral reflux recruited for a multicentre, international therapeutic trial comparing medical and surgical management. J Urol1992;148:1644–9. Smellie JM, Barratt TM, Chantler C, et al. Medical versus surgical treatment in children with severe bilateral vesicoureteric reflux and bilateral nephropathy: a randomised trial. Lancet2001;357:1329–33. Wennerstrom M, Hansson S, Jodal U, et al. Primary and acquired renal scarring in boys and girls with urinary tract infection. J Pediatr2000;136:30–4.